Last week we talked about running while expecting and this week we are talking about working out while expecting. From the beginning, just like with running, I knew I wanted to do my absolute best to continue to work out as much as was safely possible for as long as possible. I knew that continuing to run and work out would 1. be beneficial for my body and the baby and 2. help me continue to feel like myself. 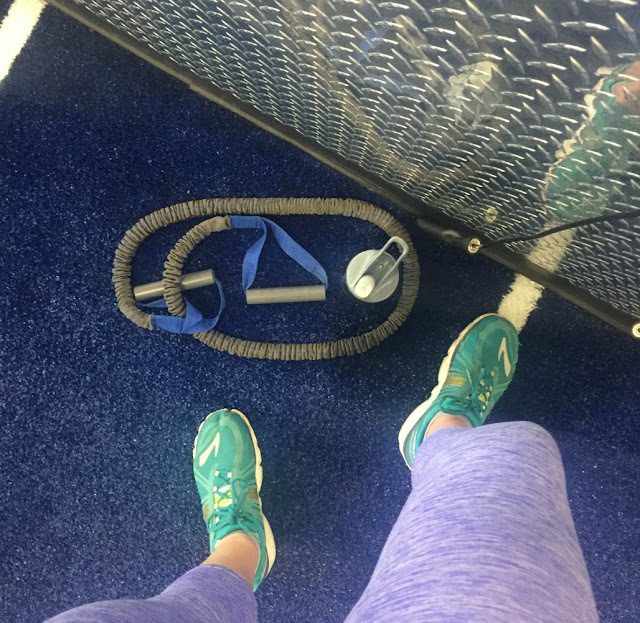 At the same time, I also knew that I may not be able to work out as intensely as before or that there would be weeks that I didn't feel like working out 5-6 days a week. But I told myself as long as I made an effort to either get to gym, work out downstairs or go on a long walk that would be sufficient. On the flip side, I knew that making sure I was getting ample rest was and is just as important. I am happy to report that 5 months (! how has it been that long already?!) that I am still working out 4-5 days a week. In fact I went to the gym the day we found out, which Mister thinks is so funny. Generally I work out Monday - Thursday and Saturdays. I give myself off Fridays and Sundays for rest and recuperation. I will say that my workouts are not as intense as they were pre pregnancy but I think doing something is better than nothing! 1. Less is more : I did quite of research once I found out we were expecting and what was acceptable for working out/lifting. Over and over again I read about using less weights/less reps. This is the theory I've stuck with for the majority of the time. While I used to do 3 sets of 20 reps, now I do 3-4 sets of 12 or 3 sets of 15. It may not seem like a large difference but it is. I am also now very conscious of the actual weight I am using. There are some reports out there that say not to lift over 20lbs, which is a good rule. Our doctor told us to just be careful but did not put a specific weight limit on me. That being said, I am very conscious of the weights I am using. There are no 200lbs dead lifts going on over here. 2. Use your body : Body weight exercises have always been a great workout for me and proved successful. This is even more true now that I am carrying more weight around. It just makes sense, more to move, more to work out and lift. I have recently switched to girl push ups because regular ones were getting quite tricky. But otherwise, I have kept everything else pretty much the same. Other exercises that are extremely effective are: variations of squats and lunges, triceps dips, girl push ups, donkey kicks, single leg bridges, speed skaters, burpees, step ups and the list goes on! 3. Keep it safe : Above all else, it is most important to work out safely. Listen to your body and how you feel. If something doesn't feel right, stop, rest and try again the next day. Always remember to stay very hydrated and your heart rate low. After the second trimester it is advised to eliminate any exercises that require you to lay flat on your back. So say goodbye to crunches/bicycle crunches on the floor. But the exercise ball can be your friend! There are plenty of good moves besides crunches that use the ball. It is almost important to watch your balance and steps. Pregnancy causes your ligaments to get all loosey goosey causing clumsiness and being general off balance. Let me know if you have any questions, I am in NO WAY an expert but I've done a far share of reading as this topic is extremely important to me. Thank you for posting this! I'm so proud of you for staying as active as possible while pregnant. I hope to do the same when that day comes. Also, I may or may not be working on a fancy little onesie for floyds new bff. I really admire you for sticking to your fitness routine while pregnant. I didn't have much of one pre-pregnancy, so I've been terrible about trying to work out now. I had high hopes of doing a lot of walking this summer, but it has been so hot and muggy here that even that hasn't happened much! !